It’s 2019 at last; and while the snowy Halifax blues might be setting in, this season’s theatre lineup is sure to brighten those dark winter days. Filled with plenty of homegrown talent, old favourites and even a Canadian Premiere – this theatrical season in Halifax is one not to be missed (and it can be experienced on a student’s budget). Neptune Theatre has an exciting repertoire of new and iconic plays coming to their stages in 2019. 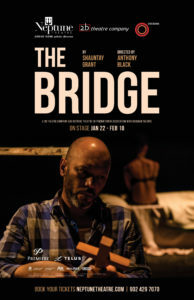 Starting the busy and dazzling new year at Neptune Theatre is The Bridge, an exciting new play by multi-talented Halifax native and Dalhousie professor, Shauntay Grant. The play is set in a rural, Black Nova Scotian community; Neptune Theatre’s website describes the play as one that “explores the complexities of a relationship between two brothers strained over 20 years of secrecy, sin and shame.” This co-production between 2b Theatre and Neptune Theatre with Obsidian Theatre, directed by Anthony Black, will run from Jan. 22 to Feb. 10 on the Scotiabank Stage. Neptune’s The Bridge is written by Dalhousie professor Shauntay Grant. It runs from Jan. 22 to Feb. 10. Photo provided by Neptune Theatre. Next on the roster is Rose Napoli’s, Lo (Or Dear Mr. Wells). The play explores the power dynamics of a teacher-student relationship turned intimate. Lo (Or Dear Mr. Wells) has been nominated for Dora Award Best New Play for playwright Napoli. Directed by Anne-Marie Kerr and featuring Celia Koughan and Josh MacDonald, this production runs from Feb. 5 to 24. 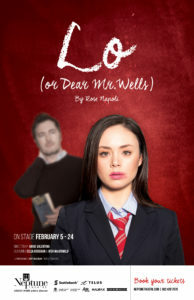 Lo (or Dear Mr. Wells) runs from Feb. 5 to Feb. 24. Photo provided by Neptune Theatre. Neptune’s Artistic Director, Jeremy Webb, will be taking on Michael Frayn’s iconic comedy Noises Off from Feb. 26 to March 17 on the Fountain Hall Stage. After great success with his panto (an interactive, comedic take on a traditional story), Cinderella, Webb is taking on another comedy that is hailed as the “funniest farce ever written,” by New York Post writer Clive Barnes in 2001. Noises Off gathers a troop of some of Halifax’s best talent that’s sure to get laughs from the audience. Next up on the Scotiabank Stage: Daniel MacIvor’s New Magic Valley Fun Town, A co-production of Prairie Theatre Exchange and Tarragon Theatre, Directed by Richard Rose. Neptune advertises this play as one “about survivors and those who love them.” The story follows the main character, Dougie, experiencing a visit from his childhood friend and exploring memories that might’ve been easier to forget. This show runs from April 4 to 21. 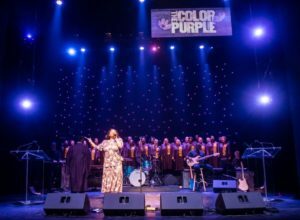 The exciting Neptune season-ending musical of 2019 will be the Canadian Premiere of The Color Purple. The musical is based on the Pulitzer Prize-winning novel by Alice Walker; Neptune boasts that the play “features a joyous score containing jazz, ragtime, gospel, rhythm and blues.” The Color Purple is an inspiring tale of a woman who finds strength through love, triumphs over adversity and finds her voice. Directed by Kimberly Rampersad, this feel-good musical will run from April 9 to June 2. Cyndi Cain and the Nova Scotia Mass Choir. Photo by Stoo Metz, Neptune Season Launch. If you’re on a budget, make sure to check out Neptune’s “student rush” tickets and their “Pay What You Can” nights to make sure you don’t miss any of these incredible productions. Closer to home, there are a lot of exciting concerts and theatre happening in the Dalhousie Arts Centre this winter. From Jan. 31 to Feb. 3, the Fountain School of Performing Arts presents Emmanuel Chabrier’s opera L’Étoile. 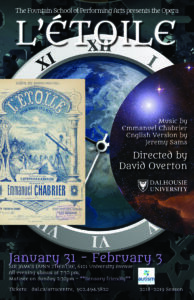 Dalhousie’s Fountain School of Performing Arts will be put performing L’Étoile from Jan. 31 to Feb 3. Poster provided by Dalhousie University Fountain School of Performing Arts. From Feb. 5 to 9, the third-year acting students will delve into the mythology of history’s most notorious womanizer, in Ödön von Horvath’s, Don Juan Comes Back From The War. 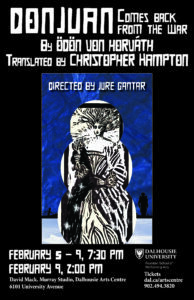 Set immediately after the First World War, this play sees a misplaced Don Juan trying to pick up the pieces of his life in a world made up of only women (most of which are not pleased to see him). Directed by Fountain School staple, Jure Gantar, with an innovative use of music and space, this is a production not to be missed. Their following show will be Don Juan Comes Back From The War from Feb. 5 to 9. Poster provided by Dalhousie University Fountain School of Performing Arts. On Feb. 14 – for one night only – is the incredibly popular Concerto Night in the Sir James Dunn Theatre. An always-spectacular showcase featuring the Dalhousie Symphony Orchestra and soloists performing some of the best movements, pieces and arias in history. To cap off the Fountain School season is a theatrical event not commonly seen: An Evening of Moliére One Acts, which will feature exquisite sets, bougie costumes and all of the zany comedy that Moliére is known for. Directed by commedia dell’arte expert, Gabrielle Houle in a new translation by Justin Blum, Moliére’s The Forced Marriage and The Precious Maidens Ridiculed will be brought to life in a fresh and hilarious new way. And for the music lover, in the Rebecca Cohn theatre are Symphony Nova Scotia’s: Handel’s Water Music (Feb. 2 to 3), the Baroque Fireworks performances (March 16 to 17) and Coppélia, featuring Canada’s ballet Jörgen (April 12 to 14). Make sure to also keep your eye out for some smaller, independent, theatre ventures this winter. Many will offer student/under-waged prices on tickets to make theatre accessible. Matchstick Theatre, which will be putting on Michael Melski’s contemporary Nova Scotian tragedy Joyride from Jan. 24 to 27 at the Scotiabank Stage (Neptune Theatre). Below the Salt, will be putting on an “unexpected and immersive” production of Shakespeare’s Hamlet, running Jan. 9 to 20 on the Scotiabank Stage. The Villain’s Theatre, turns a classical comedy into a contemporary courtroom drama with FOX (a reimaging of Ben Johnson’s Volpone), adapted by Dan Bray with Kathryn McCormack and Colleen MacIsaac, from Feb. 20 to 24 at the Dalhousie Weldon Law Building. The Dalhousie Theatre Society, starts their Winter 2019 season with Tom Stoppard’s brilliant fusion of art and science, Arcadia, from Jan. 19 to 23 at The Bus Stop Theatre. The Kings Theatrical Society, will be hosting their annual Infringement Festival January 28 to Feb. 2, which is guaranteed to provide an eclectic mix of short pieces performed across numerous sites.